As we know, Apple believes that God give them the right to be the only one to design a tablet that looks like a tablet. Apple has tried to practice this right many times by suing companies like Samsung in Japan, US and other countries. Claims like these makes people believe that Apple is the only company that can originally design a tablet using their imagination and not having to copy other companies ideas and designs, like it happens to Samsung. But it seems that Apple is not that original as most people think. While trying to persuade a judge that Samsung copied the iPad’s rounded corners and big glass screen for its Galaxy Tab 10.1, the judge told Apple that the idea and design of the iPad was invented before them by Fidler Knight Ridder video illustrated in 1994, as Bloomberg Businessweek reports in its Apple’s War on Android article. Apple got even more discouraging results on its iPad design. 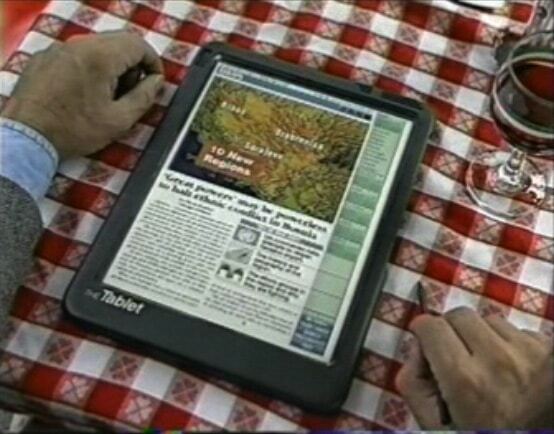 Again peppering her ruling with handy graphic illustrations, Koh showed how the crude-looking 1994 Fidler/Knight Ridder tablet, designed for reading newspapers digitally, created “the same basic visual impression” as Apple’s D’889 patent for the iPad. “The Court,” she wrote, “therefore finds that Samsung has raised a substantial question regarding the validity of the D’889 patent on obviousness grounds.” So, maybe the iPad’s design is up for grabs! In any event, Koh declined to enjoin Samsung’s Galaxy Tab 10.1.